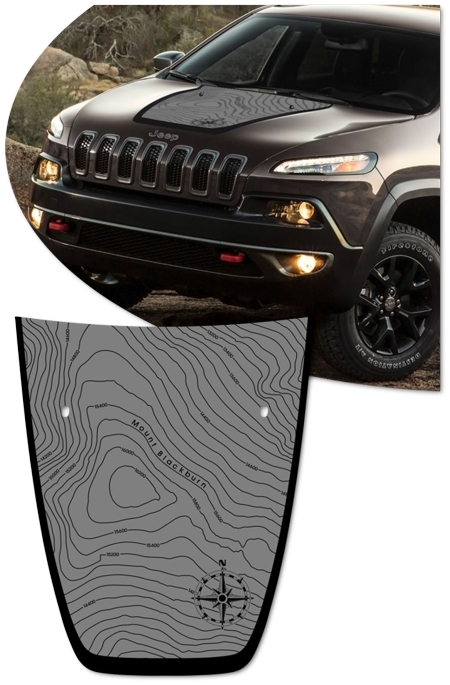 Make your '14-Current Jeep Cherokee's Hood stand out with this great-looking Blackburn1 Edition topographical Hood Graphic kit. Kit is PRECUT and ready to install in a wide variety of colors - NO TRIMMING required! Digitally printed in neutral Grey and Black tones with our DuraCOLOR graphic technology, kit is manufactured with premium automotive grade vinyl film materials. As a further step, graphic is covered with a 2.0 mil clear laminate (gloss or matte) which looks great and provides protection from miles of abuse. This Hood Graphic package is not just a rectangle of vinyl in a box. Our graphic kit consists of a prefitted and contoured piece as shown in the illustration. Kit is specifically made for the '14-Current Jeep Cherokee factory Hood and will not fit any other vehicle. 1Mount Blackburn is the highest peak in the Wrangell Mountains of Alaska in the United States. It is the fifth highest peak in the United States and the twelfth highest peak in North America. Our graphic kit celebrates this tough peak. 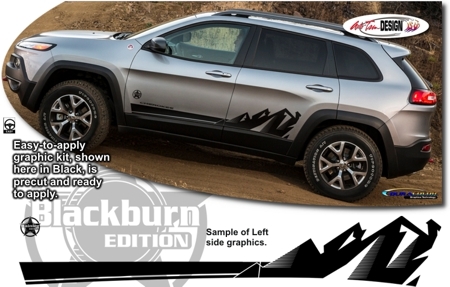 Graphic kit is vehicle specific and will fit any '14-Current Jeep Cherokee. It will not fit any other vehicle.